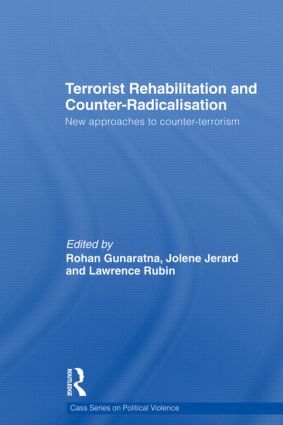 This book seeks to explore the new frontiers in counter-terrorism research, analyses and practice, focusing on the imperative to rehabilitate terrorists. The post-9/11 world is in a very early stage of global rehabilitation both of terrorists and criminals. Nonetheless, some correctional rehabilitation programs have led convicted and suspected terrorists to express remorse, repent, and recant their violent ideologies and re-enter mainstream politics, religion and society. Although operational counter-terrorism initiatives have received both investment and attention, strategic counter-terrorism initiatives that ultimately end violence including terrorism but require patience and sustained efforts have been neglected by governments and received inadequate public coverage. This book is an early attempt to examine a few case studies both by practitioners and scholars. This book provides a better understanding of the process of deradicalization, and will be the first step towards exploring the development of tools necessary to examine and address challenges faced by practitioners. This book will be of much interest to students of terrorism and political violence, radical Islam, conflict resolution, war and conflict studies and IR/Security Studies. Rohan Gunaratna is Head of the International Centre for Political Violence and Terrorism Research at the S. Rajaratnam School of International Studies, Nanyang Technological University, Singapore. He is author or editor of 12 books on terrorism. Jolene Jerard is an Associate Research Fellow and Manager of the International Centre for Political Violence and Terrorism Research (ICPVTR), at the S. Rajaratnam School of International Studies (RSIS), Nanyang Technological University, Singapore. Lawrence Rubin is an Assistant Professor in the Sam Nunn School of International Affairs at the Georgia Institute of Technology. He is the Associate Editor for the Journal of Terrorism and Political Violence.